Jersey Will Raise Funds to Promote Bicycle Safety and Provide for an Educational Trust Fund for Turner and Tyler Doolittle, the surviving siblings. On Sunday morning April 3, 2011, father and son David and Trey Doolittle were riding their bicycles - training for a triathlon in the bike lane on River Road in Wilmington - when a drunk driver struck them from behind, killing them both. This could happen to anyone at any time and something needs to be done to promote bike safety and community awareness about sharing the road. StreetSafe, a local non-profit group, with support from Two Wheeler Dealer, Trysports Wilmington, Set-Up Inc., Without Limits, the YMCA, Sign-O-Rama, and Port City Digital; joined together in the wake of this tragedy with a desire to raise awareness for cycling safety and to start an educational trust fund for David and Joy Doolittle’s two surviving children. "I wanted to find a way to raise awareness in the community about cycling safety and to draw attention to the horrible consequences of drunk driving" says Doug Darrell, founder of StreetSafe. "This seemed like a good way to both honor David and Trey’s memory and to raise money for a good cause, while raising awareness and promoting safety at the same time. My hope is that any time someone sees a rider wearing the bright yellow Doolittle jersey, it will be a reminder to slow down and take extra precautions". Promotion and sale of the jersey can be found on the Doolittle Jersey website: www.doolittlejersey.org and at various triathlon and cycling events. It is also available for sale at Two Wheeler Dealer and TrySport stores. The Doolittle Jersey will had its debut with a special table at the YMCA Triathlon held Sat., Sept. 17th, 2011 at Wrightsville Beach. The Doolittle Jersey is dedicated to honoring the memory of David and Trey Doolittle. 100% of the proceeds from the sale of the jersey will go to an educational fund for David's surviving 12 year old twin boys, Turner and Tyler Doolittle (Trey’s brothers) and also to raising awareness about cyclist safety in our community. When Joy Doolittle first put on the shirt, her reaction was one of immense gratitude. "With tears in my eyes and a smile on my face, I thank you for what you're doing!" The jersey was created and designed by Trey Doolittle’s classmates and friends from his art class at New Hanover High School under the direction of their Art teacher, Ms. Sarah Jones. David Doolittle (1964 – 2011) was an avid triathlete, surfer and marathoner. 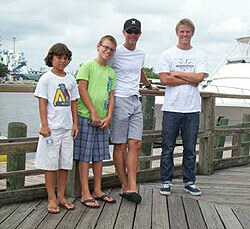 He ran several Iron Man distance triathlons, the last in 2002 with his then 16 year old son Trey. An employee at Onslow County Hospital in Health Care Management, David worked hard and played harder. He was always active, always had a story to tell, loved life, travel and music and was never still. He tried to instill in his three sons, Trey, Tyler and Turner that work came first, and afterwards, play. Trey Doolittle (1993-2011) had a beautiful smile, a great sense of humor and was a joy to be around. A senior at New Hanover High School, he was enrolled in many AP and Honors courses, loved to read, but especially enjoyed art. He had planned to attend ECU this fall and had narrowed his career choices down to architect, anesthesiologist or publisher. In 2009, along with his dad, Trey attempted his first Iron Man Triathlon, beating his dad in the 2.4 mile swim by 4 min., biking the 112 miles with his dad at his side. After 7 miles of the 26.2 mile run, however, his body shut down due to hypernatremia (too much water intake) and he was unable to finish the race. Not to be deterred, he and his dad were training for future triathlons together when they were struck down. The senseless death of David and Trey Doolittle at the hands of a drunk driver is a tragic loss that was felt by the entire community. Through increased safety education and cycling advocacy, it is the goal of the Doolittle Project to promote better awareness on sharing the road, with the hope of preventing future tragedies. The Project also hopes to raise enough funds to provide a good foundation for Tyler and Turner’s future education. Says Darrell, "If we can save one life, or prevent one serious injury through this project, I can think of no better way to honor David and Trey’s memory".